The iPod nano's susceptibility to scratching remains the target of lawsuits, Microsoft promises to challenge the iPod's dominance (eventually, somehow), WiFi and Bluetooth may come to iPod soon, rumors of a "true video" iPod with 3.5" screen, UK outfitter offering custom painted iPods, and lots more in this week's iPod news roundup. Apple Gearing Up for 3.5" Video iPod? "Posh gents' outfitters Bamford & Sons has followed Selfridges down the expensive iPod-related services path by offering to paint any new iPod bought at one of its London stores with a custom colour scheme of the buyer's choice. It's a snip at between £121 and £196 excluding the cost of the music player. "B&S isn't opening the service up to existing iPod owners, but if you're after a brand new 4 GB iPod nano or 60 GB iPod, you can get one with a custom paint job from a B&S shop for £300 and £495, respectively. It's a bespoke service so you'll have to wait up to three weeks...."
"There's a choice of 23 hues ranging from Ferrari red, steel and techno blue through to candy apple red and jet black...."
"Microsoft and its hardware partners will continue to develop new digital media devices aimed at challenging the dominance of Apple Computer's ubiquitous iPod music player, Chairman Bill Gates said on Friday." "The Microsoft founder praised Apple's iTunes music store and said the software giant was talking with hardware partners to create media devices that can be less expensive and easier to connect and can handle pictures and video better." "A consumer group has filed yet another lawsuit against Apple, claiming its popular iPod nano music player, marketed for its sleek beauty, cannot withstand normal use without becoming severely scratched, often to the point where its screen is unreadable. The suit was filed in San Mateo Superior Court in California. "Moreover, the plaintiffs charge, Apple is refusing to give refunds to purchasers who bought the defective product, while forcing others to pay a $25 fee to get a replacement that is supposed to be 'free' under Apple's warranty." "The availability of wireless iPods came a step closer today after PortalPlayer, the chip maker behind the Apple music player's audio logic, will add Wi-Fi and Bluetooth support to its products, Reg Hardware has learned. The move comes courtesy of a tie-in with UK-based Bluetooth chip design pioneer CSR, a.k.a. Cambridge Silicon Radio. "PortalPlayer said it will integrate its PP5022 audio chip family with CSR's UniFi Wi-Fi and Bluetooth controller. It will demonstrate a reference platform based on the combined technology next week at the 3GSM show in Barcelona." "Ready for your wireless iPod? "Reading between the lines, such a product in the short-term pipeline seems to be the implication of a recent announcement from PortalPlayer and from what executives of the chipmaker had to say at an investor conference on Wednesday. "In an interview with TheStreet.com, Johnson declined to say if or when Apple will release a wireless iPod. An Apple representative did not return a call seeking comment, but the company is typically tight-lipped about future product plans." Link: Is PortalPlayer Showing Apple's Hand? "Time to drool, iPod fans. Apple is preparing the long-anticipated video-specific iPod, complete with a 3.5in, colour touch-sensitive display that covers the entire front face of the device and sporting a virtual clickwheel, according to a report posted on the web today." "It's a modern dilemma: That iPod you got last year seems so lame now that a newer version is out. If you're the type that needs to switch up MP3 players like you change sneakers, one of the easiest ways to unload the devices is by selling them on Websites like eBay or Craigslist. "The Recording Industry Association of America - the lobbying group behind the thousands of lawsuits over unauthorized sharing and downloading of songs - says the answer is definitely no...."
"Apple computer caused a big splash recently by introducing a new iPod that can play videos and by starting to sell videos, as it does songs, at its iTunes Music Store. This new iPod will very quickly become the bestselling handheld video device, mostly because people will buy it mainly for its music capabilities. "But as slick as it is, Apple's latest baby isn't the only path to portable digital video available to consumers. Others got there first. All, including the new iPod, suffer from a dearth of legal downloadable content, but that has begun to change as Hollywood and the television networks seem willing, suddenly, to sell individual episodes of television series. "Here's a quick guide to some leading portable video devices." PR: SellyourCell.com, America's Original Wireless Recycler, will purchase used Apple iPod portable media devices from consumers for between $19 and $149. "Offering to purchase the Apple iPod is big step for us, as it is outside of our corporate emphasis on cell phones. However, the Internet infrastructure and technical facilities we have in place are well-adapted for adding this to our product mix. Additionally, we love the iPod as a product, and look forward to repurposing ones that would wind up in someone's drawer until they were obsolete," said Keith Ori, CEO of SellyourCell.com. "Apple is coming out with new, better, and smaller technology at a faster pace than even the wireless phone industry, which is amazing in and of itself. However, this creates very short product life cycles, and therefore the need to recycle is apparent," said Ori. To facilitate the iPod purchase, SellyourCell.com has added an iPod category to their website. Fifteen different iPod models will be purchased. Each individual model of iPod is clearly described to avoid confusion on the part of the site user. In addition to paying consumers to recycle their iPods and cell phones, SellyourCell.com has always offered free shipping, and their new "Speedy Ship" option allows the consumer to download a pre-paid return mailing label at the time of the order. "We are the first company of any scale that we are aware of to offer to purchase and recycle iPods for consumers, and it is exciting to be an innovator," Ori said. SellyourCell.com is a six-year-old subsidiary of Sundog Inc., based in Orlando, Florida. Sellyourcell.com offers to pay consumers to recycle their used cell phones and Apple iPods through their website www.sellyourcell.com . This process eliminates a number of hazardous and harmful substances from coming into contact with the environment and provides a generous financial incentive for participating. SellyourCell.com is one of the oldest companies offering this type of service and continues to be a leader in the wireless recycling industry. PR: freeridecoding announces the SyncupX contest, awarding the most creative use of smart folders (saved searches) for a SyncupX backup configuration. The winner will receive a new iPod shuffle (512 MB), the runner-up will receive a free license for SyncupX and BurnAgain. Submission guidelines and details can be found on the freeridecoding.net blog. The contest is accepting submissions between 10 Feb. 2006 and 25 Feb. 2006. The winner will be announced on 27 Feb. 2006 on the freeridecoding.net blog. SyncupX is freeridecoding's backup application "for the rest of us" that features an iSync like interface and a unique ease of use. SyncupX, set up in less then 5 minutes, does also accept smart folders (saved searches) as backup sources and for file filtering. Using this Spotlight integration SyncupX allows easy configuration of powerful dynamic backup sets ("only the purchased music in my iTunes Library") that would otherwise be impossible. Other SyncupX features are archiving, easy automation using Automator or iCal, a headless (commandline) mode for pro users and easy management of multiple backups. SyncupX is already available as Universal Binary. More information on SyncupX, its features, and a trial download can be found online. SyncupX is priced at $20 for a single license, $35 for a family pack. Educational or site licenses are available upon request. "You can set iPod to turn off automatically after a specific period of time. "To set the interval before iPod turns off, select Extras > Clock > Sleep Timer. Then select the time you want. "When you set the sleep timer, a clock icon and the number of minutes left until iPod turns off appear near the top of the Now Playing screen." "You can use your iPod as a hard drive to store and transfer data files on (also known as disk mode). Select your iPod in the iTunes Source list. Click the Options button in iTunes. The iPod Preferences window appears. Select 'Enable disk use' or 'Manually manage songs and playlists'. Either one will allow you to use iPod as a hard disk. If you select 'Manually manage songs and playlists', iTunes won't automatically update iPod with the iTunes library. If you want iTunes to automatically update your iPod, select 'Enable disk use' instead. The iPod disk icon appears on the desktop and in Finder windows, and in My Computer in Windows. Double-click the icon and drag files to or from iPod's window to copy them. Make sure to eject iPod before disconnecting it from your computer. PR: nanoShell is a clear protective jewel case for the nano that can be worn on the hip, carried in hand, or placed in a pocket or bag. The nanoShell cases come in five different shades: Crystal Clear, Tech Lime, Indigo Blue, Perfect Purple, and Pretty in Pink. And it's only $14.99. Comes in five different colors: Crystal Clear, Tech Lime, Indigo Blue, Perfect Purple and Pretty in Pink. 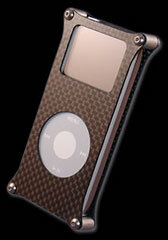 The nanoShell also features two ways for an owner to carry and protect their iPod nano. Two optional backings are included to provide complete nano protection and mobility - one with a built-in belt clip and the other with a smooth back surface. The nanoShell's backs simply slide and click into place with no hassle or fuss. The nanoShell has an opening for access to the nano's click wheel. It also has openings for the hold switch and earbud port. Once your nano is safely secured in the nanoShell, there isn't any reason to remove it. Add some flavor and color to your nano while giving it the best protection available, the DLO nanoShell. Nano case made from real aerospace carbon fiber, aluminum, and stainless steel screws. Also includes stainless steel belt clip, a protective clear cling-on screen protector, and assembly tool. 5G video iPod case made from real aerospace carbon fiber, aluminum, and stainless steel screws. Also includes stainless steel belt clip, a protective clear film screen protector, and assembly tool. Choose 30 GB or 60 GB size. PR: This iPod walking tour now becomes another Philadelphia first: It's the first to combine pictures and audio in a user-friendly, menu-driven guide. This happened when AudioWalk & Tour of Historic Philadelphia joined forces with iPREPpress to bring its nationally acclaimed walking tour to the iPod audience. Since 1984, the 82 minute narrated walking tour of Independence National Historical Park has taken thousands of listeners back in time with little known stories that paint a colorful picture of life in 18th century Philadelphia. Even before the iPod made touring easier, Travel Holiday Magazine said the AudioWalk is "the best way to see historic Philadelphia," and the Philadelphia Inquirer said, "It's a gem." Now it's all that, and more. "We're proud to bring this leading walking tour to the iPod," said Kurt Goszyk, founder of iPREPpress. "Ben Franklin would have approved! The iPod is a powerful tool that makes learning history fun and more convenient to access. Bringing educational content to the iPod is a natural step in the evolution of iPod content. Given the popularity of the iPod among high school and college students and travelers of all ages, iPREPpress and ushistory.org give students a way to improve their educational and travel experience through audio and visuals on the iPod. We look forward to offering more educational tours in the future." This narrated tour CD is still available for rent or purchase at the Independence Visitor Center and Lights of Liberty shop or through Independence Hall Association's website. But now, anyone with an iPod can also download the tour and map for only $9.95 from ushistory.org or iPREPpress. "We're excited about our collaboration with the iPod and iPREPpress," said Nancy Gilboy, the AudioWalk's writer and producer and the president of Philadelphia's International Visitors Council. "With the tour and map both on iPod, learning American history doesn't get any easier or more fun, and tourists can now plan their historic Philadelphia visit without waiting for the tour CD to arrive in the mail. The iPod tour guide features the same audio content as the CD version and also provides photos, easy menu navigation with audio hyperlinks. The tour takes listeners back to the 1700s on a stroll along cobblestone streets, to an 18th century garden, to the home of a First Lady and the site of where a future King of France lived (listeners find out why he didn't marry the Philadelphia woman he loved.). Twenty stops with 65 narrated segments are included in the tour, with music and hundreds of fascinating facts. And of course, there's a section on everyone's favorite fascinating Philadelphian, Ben Franklin. Washington Crossing, Pennsylvania-based iPREPpress offers best-of-breed content formatted specially for the iPod. iPREPpress is the only company offering the SparkNotes Study Guides in text version from Barnes & Noble. It also presents travel guides, important national documents and access to sports and entertainment content for downloading to PCs and Macintosh computers. PR: Video2Pod makes for comfortable converting of your movies to the new iPod with video functionality. The new iPod of the fifth generation allows you to store and, of course, play back up to 150 hours of video material with a screen resolution of 320 pixels wide by 240 pixels high. Video2Pod was especially devised for the optimal conversion of a movie to this size. All formats supported by Quick Time 7 are supported by Video2Pod too. Features: Overview over your movie folder MPEG-4 and H.264 export to iPod Variable quality Record movies with your iSight or DV cam Converted files are sent to iTunes and iPod. Video2Pod allows you to directly record movies via FireWire or DV-camera. By using the two buttons below left, you can either save your recorded movies onto your hard disc or transfer them into the iTunes library. You can keep the same settings that you have established to convert movies. The iPod Video can play two video formats: MPEG-4 and MPEG-4 H.264. While the latter does achieve a better quality, the conversion process with H.264 takes a little longer. The settings also allow you to influence size and quality of the movie you are converting. PR: iSquint is an iPod video conversion app for Mac OS X. It's many times faster than QuickTime Pro, works with almost all popular video formats, and it's infinitely free-er. It's also really easy. Just drag in your file, and click Start. On a 1.5 GHz G4, iSquint can convert most video files to iPod-screen-sized videos in realtime. New build of ffmpeg. Also, every included tool is now a Universal Binary! Conversion from QuickTime on PPC Macs up to 25% faster! Conversion from QuickTime on Intel Macs up to 150% faster! Certain Windows Media files now convert up to 200% faster! Now with [undefined]% more beeps upon job completion! Version number now 6.6% bigger! What's New list 600% longer! Converted videos are now Fast-Start enabled for better Internet distribution! 60% certainty that the .mp4 comma framerate problem's fixed! PR: Podmaxx enhances and expands iTunes by allowing users to easily copy music and playlists from ANY iPod to PC, manage podcasts, backup valuable data (so music and other files won't be lost! ), sync email and contacts (including Outlook), View the latest synced news, weather and movie times ... all with one application. And now users can convert any DVD movie to watch on the new Video iPod! Over 14 million people bought or received an iPod in the last 3 months of 2005. iPod - the hottest Christmas gift - now has nearly 40 million users. Bling Software has the perfect companion tool to unlock more iPod potential . . . Podmaxx Video. PC users are constantly searching for ways to fully use the new Video iPod . . . and Podmaxx Video expands functionality by providing DVD Movie transfer to the new video iPod. "In just two months, more than 4 million movies have already been downloaded from Apple's iTunes. People want video on their iPods," says Bling Software Director Lyn Bell, publisher of XCopy9, Podmaxx, Ring Factory and other successful PC utilities. "TV networks have quickly agreed to offer new and Classic shows for the first time. Downloads are great for new releases, but if users already have DVD movies that you want on your iPod, Podmaxx Video will transfer it perfectly every time." DVD Movie Transfer Allows you rip and transfer any DVD Movie that users own right to the Video iPod with speed, simplicity and perfect quality. Podmaxx - available via download or CD shipment - carries a suggested retail price of $19.99. Podmaxx Video is priced at $24.99. Software system requirements are an Internet connection, Windows 98/ME/2000/XP. All Podmaxx applications are available in-store at Circuit City, Fry's, Comp USA, Office Max and other major retailers or via download. PR: TopXNotes iPod- your solution for notes on iPods. TopXNotes iPod works exactly like TopXNotes, but you can now select a choice of notes for export to your iPod. Your "iPod notes" will be placed in the Notes folder of your iPod in the same order as in your TopXNotes iPod notepad, and your Groups containing iPod notes will also appear on your iPod. So if you have a "Home" Group containing an iPod note, that note will be in the "Home" Group on your iPod. With TopXNotes iPod you easily manage notes, exactly like you do in TopXNotes, but now will have the added capability to export selected notes to your iPod. Then just choose Export iPod Notes from the File Menu (or press the button with the iPod icon) in the lower toolbar, and all notes that have their category set to 'iPod Note' will be exported to the iPod Notes folder along with the note's group, if it is in a group. So an iPod note in a group will be in the same Group on your iPod. You can export your entire group hierarchy if you wish by designating one note in each group an iPod note. After Export of your iPod Notes to your iPod your iPod notes can be found in the Notes folder on the iPod as shown above. Export notes to iPod (automatic and manual modes)- If you choose to export notes to iPod all notes that have their category set to 'iPod Note' will be exported to the iPod notes folder along with the groups hierarchy. Export Notes to iPod button in the lower toolbar- If you choose to export notes to iPod all notes that have their category set to 'iPod Note' will be exported to the iPod's Notes folder along with the groups hierarchy. So an iPod note in a group will be in the same group on your iPod. Repaired cosmetic error on Splash screen. Disabled Note Settings menu option for encrypted note. Disabled Open menu option when main window already open. Changed color options for note background. Corrected display of note number in Organizer on deletion of group when multiple groups present. Enabled large notes (over 4 kb ) to be truncated and then exported. Mac OS X 10.3 (Panther) or higher is required for TopXNotes iPod. TopXNotes iPod also requires a newer (3rd generation or newer) iPod. Apple has not used the informal "generations" terminology and it is not easy to find out about. However, if an iPod has an LCD and Dock connector, and the Apple Notes Reader is installed, it should work. We hope to present a more formal list of models in the future. PR: Automatically launch applications and scripts whenever you connect an iPod to your Mac. Auto-sync your personal information via iPDA. Backup your vital data or sync folder contents between your home and work Macs (sample AppleScripts provided). The possibilities are endless! Launch any application or AppleScript. Selectively control which items are launched and the order in which they're launched. Specify a minimum amount of time between launches. For example, you can connect your iPod in the morning and have it launch your applications and then have iPod Launcher wait 8 hours before doing another set of launches. You can connect your iPod as many times as you want and applications won't launch until those 8 hours have passed. With this version iPod Launcher is now a Universal application and some rare launching problems have been fixed. PR: Syncs a variety of information to your iPod such as news, weather forecasts, movie showtimes, lyrics, text files and more. Think your iPod was designed just for music? Think again! If you're not taking full use of your iPod's extended capabilities, then you're missing out! You may ask, "What other capabilities?" The iPod has a few extra features on it that allow you to view your address book contacts, calendars, to-dos, and even notes! This is where Pod2Go comes in to play. 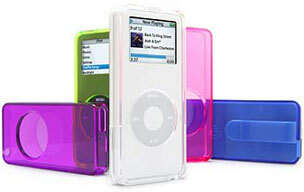 Pod2Go takes any iPod (except the shuffle), whether it's the first iPod ever created, a brand new iPod color, or an iPod mini, and expands the functionality of it by putting a variety of textual content onto it for your reading enjoyment. For example, on your ride to work, you could be staying up-to-date with the latest news, checking tomorrow's weather forecast, browsing the local theater's movie showtimes, or getting directions to that new restaurant across town. Or if you're a college student, you could be studying those Word formatted notes your buddy emailed you before your exam, without books or papers. If you're an email addict, you can keep those important messages with you wherever you go. There's an endless stream of possibilities! This version fixes a bug with certain encodings of articles from a feed in News where they wouldn't be displayed properly on the iPod. It also adds a color iPod icon to replace the black and white icon in the menu bar, and a few other small enhancements. System requirements: Mac OS X 10.2.8 or later. PR: podFlicks is a stand alone application that will convert your movies into a format acceptable by the fifth generation iPods which have video playback capability (these iPods are also being referred to as the wide iPod or video iPods). No longer do you need to rely on QuickTime Pro and iTunes to get your video content onto your iPod. Just select your movie and click a button; podFlicks will prepare your movie and copy it to the iPod where you will be able to view the movie with a scroll and a click on the iPod. It just doesn't get any easier to get your movies from your Mac computer onto your Video iPod. The easiest all in one solution for managing video content for your iPod. Convert your movies into an iPod compatible format - no need for QuickTime Pro. The quickest way to get your movies onto your iPod, configure a couple of settings, click a button and off you go! Distinct Movie Library: keep your Movies separate from your audio collection. podFlicks will take care of all the tedious details of getting your video content into a format that is compatible with the video iPods. No longer do you have to guess how to configure QuickTime, tweak the settings for the best quality and wait for the conversion process to be complete only to have iTunes reject the converted movie. podFlicks will automatically convert your content into an acceptable format and copy the movie directly to your iPod. Once the conversion is complete - eject your iPod, traverse to the Video: Movies menu, select your Movie and press play. Simply open the input movie, select the movie Destination, the Quality, the Destination iPod, and click a button. podFlicks will convert the input movie to a local file on your hard drive, copy that file directly to your iPod and update the iPod's database so that the movie is viewable on it. After the conversion, simply eject your iPod, traverse to the Video: Movies menu, select your movie and click the iPod's Play button. It just does not get any easier than that! podFlicks interface is simple yet intuitive. Simply pick the destination for your movies (either the iPod Color Display or the iPod Video Output) and a quality setting (Good, Better or Best) and off you go. Your movie will be converted to a file format acceptable by the iPod. Once the conversion is complete, simply eject the iPod and the movie will appear in the Video: Movies folder of the iPod. You can also check a box if you would like the iPod to remember the playback position - this is preferable for long movies. iPod which supports video - currently there is only one - the Wide iPod or Video iPod.